Hibiscus plants may the Tropical type of hibiscus, the ones with the large flowers that we know as Hawaiian Hibiscus, and these require a frost free environment to thrive. Very popular in home gardens and are also used widely in landscaping applications. 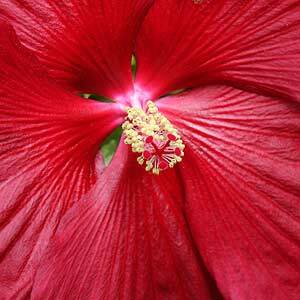 In cooler areas try growing tropical hibiscus in pots and move them to a frost free area on a patio in cooler months. Hibiscus are native to tropical and sub tropical regions around the world and include small trees, shrubs, herbaceous annual and perennial varieties. The tropical varieties are best suited to USDA Zones 9 - 11. Although they can be grown in containers and overwintered on a patio or in a greenhouse. All Hibiscus like a well drained soil rich in organic matter. A semi shaded position is best for hibiscus and will help promote better blooms. Hibiscus do well in pots. Being a soft wooded perennial Hibiscus moscheutos 'Southern Belle' does require protection from strong winds and is best secured with a stake. Plants will die back during the colder months and can be cut back or pruned heavily at this time. Protect new seasons growth from insects with a pyrethrum based spray. Tropical hibiscus are easily identified by the foliage, deep green and glossy, it is most likely a tropical variety. Flower color is another way, if its yellow, salmon pink, orange or a peachy color, its tropical. All of this does not mean you have to live in the tropics to grow them, in fact if you live in a zone that is not subject to freezes, they are probably alright in a sheltered position in the garden. However we are really looking at Zone 9 to be on the safe side. You can grow these wonderful flowering plants in containers, and this means you can overwinter them indoors or on a patio where they are protected. And you do need to protect them in winter from the cold, the rain, and even cold soil. Growing Tropical Hibiscus in containers. In containers you can easily bring them indoors, on a patio, you can also wrap the container in a fleece to stop the soil from getting cold. You can also hold back on the water a little in winter. Fertilizer is an important part of tropical hibiscus care. The general rule is to fertilize with a low strength, low phosphate every 2 weeks. A 1/4 application is adequate. Foliar feeding with a low strength spray is also good for these plants. Although not essential for flowering, pruning is required to shape plants, as well as to remove any dead or damaged wood. This is best carried out in spring,unless you live in the tropics, when any time of the years os OK.
Never prune if low temperatures are possible, new growth may not survive. Hawian or 'Tropical Hibiscus' are Hibiscus rosa sinensis, might actually be better named Chinese hibiscus where it originally came from. 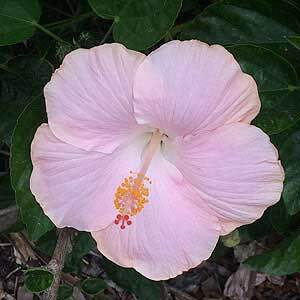 However it was in Hawaii that the first real hybridised Hibiscus were produced. Hibiscus moscheutos 'Southern Belle'. A Perennial Hibiscus with a late summer display of large flowers, almost as big a dinner plates these satiny flowers in red, pink or white are a show stopper. Hibiscus moscheutos 'Disco Belle' are a little smaller but equally attractive. Also known as the 'Rose Mallow' or 'Swamp Mallow' Hibiscus moscheutos prefer a moist position. Look also for 'Dixie Belle'. Hibiscus schizopetalus sometimes called Japanese Lantern or Japanese Hibiscus is actually a species of to areas of Africa including, Kenya, Tanzania and Mozambique. This is a fascinating species with 'hanging flowers'. Also known as the 'fringed rosemallow'.